This post is sponsored by Tabatchnick Fine Foods. We’ve all been there – hungry and needing a pre-date snack before dinner with that new fling. Couple that with summer coming up (hello, bathing suit season!). It takes too much time and energy to find healthier and cheaper alternatives to fast-food, take-out and ordering in. Everyone knows that soup is good for the soul, but this company has made an effort to deliver wholesome goodness to singletons who only need one serving. 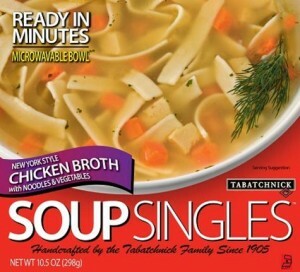 Tabatchnick Fine Foods, a leading manufacturer of handcrafted quality soups and other products, just launched their Soup Singles line, great for when you’re running late for another online date and don’t know if you’re having dinner or drinks. This tasty snack can also be enjoyed during lunch or your mid-afternoon snack when your office is blasting the cold air during the scorching summer heat. Whether you’re staying in or are on the go, Soup Singles can help get you through your day. They’re portable, affordable and convenient: Each one comes in a single serving bowl that is both microwavable and can be heated in a saucepan on the stovetop. Plus, you can get five Soup Singles for $5 at participating ShopRite Stores. There’s a flavorful variety: There are eight tasty flavors, including Barley and Mushroom, Chicken Noodle, Vegetarian Chili, Minestrone, Split Pea, Southwest Bean, Balsamic Tomato Rice and Vegetable. They’re wholesome and nutritious: Soup Singles are prepared with the finest and freshest ingredients with less fat, sodium and fewer calories than other canned soups and frozen meals, but are richer and thicker than most canned soups. And because they are frozen, Soup Singles retain more of their nutritional value. They’re SO perfect for one, you can savor each spoonful – and you don’t even need to share! Singles need to get the love they deserve and Tabatchnick Fine Foods wants to help. Why not try a Soup Singles today? For more information, visit their Facebook page.